Booth #1972 - Our family of PowerGrip products are fully compatible with every type of thermoplastic (TPO and PVC) roofing system and with modified and built up roofing too. Booth #538 - For SPI 2018, Roof Tech will be introducing an innovative mounting base for conventional rail installations on asphalt or metal roofing. 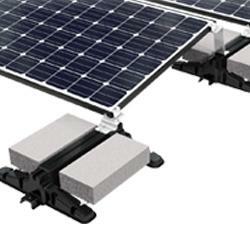 Our new product - the RT MINI - is a self-flashing base for traditional rail mounting PV systems.